CARACAS, Dec 14 2010 (IPS) - Rubén González, a 51-year-old welder who is the secretary general of the Sintraferrominera ironworkers union, has spent over a year in prison in Venezuela for leading a strike by hundreds of workers outside the San Isidro mine in Ciudad Piar, 550 kilometres southeast of the capital. 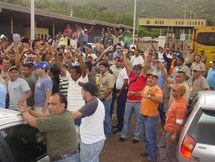 “The workers held a peaceful strike lasting 15 days in August 2009, at the gates of the (Ferrominera Orinoco) state company, demanding the payment of wages in accordance with the collective bargaining agreement,” González told IPS by telephone from the police headquarters in Ciudad Guayana, where he is in jail. The protest action ended with both sides signing a settlement at the company gates, but a few days later González was arrested and subjected to a lengthy prosecution on charges of “agavillamiento” (criminal association), instigation to commit crimes, restricting freedom to work and violating designated security areas. PROVEA, a local human rights NGO, regards González’s case as an iconic example of the criminalisation of social protest in Venezuela. Its annual report on the state of human rights, published Dec. 10, International Human Rights Day, includes a special study on protests during the 2000-2010 decade in Venezuela. “The criminalisation of social protests, using the justice system, has been growing since 2005. At present, more than 2,400 people are facing prosecution for exercising their right to peaceful protest,” lawyer Mariana Belalba, lead author of the study, told IPS. This coincides with a steady rise in the number of protests: between October 1999 and September 2010, there were 19,250 street protests in Venezuela. The annual average grew from 1,200 to 1,500 protests in the early 2000s to nearly 2,900 in 2008-2009 and to roughly 3,300 for 2009-2010, Belalba said. The special study on the decade reflects the situation of human rights under the government of left-wing President Hugo Chávez, who took office in February 1999. González said: “My case is being used to try to obstruct the workers’ struggle in basic industries (iron, steel, aluminium, hydroelectric plants) in Guayana state, and to trample on their rights and legitimate claims.” Guayana is a state in the southeast of Venezuela, with huge mineral and water resources and ecosystems that support a wealth of biodiversity. Executives at state-run companies in these industries occasionally accuse workers actively pressing union claims of being saboteurs or a destabilising influence, González complained. In his case, González said “we never carried out sabotage, and our protests were peaceful.” He stressed that he has not been an opponent of Chávez, but an active supporter, as a former local councillor and organiser of the ruling United Socialist Party of Venezuela (PSUV) in Ciudad Piar. The Committee also expressed concern about the number of charges brought against arrested trade unionists in Guayana state for activities related to the exercise of union rights. The alleged judicial persecution has gone hand in hand with repression of street protests, which was fairly low key in the first half of the decade, with 54 demonstrations put down by police in 2000 and only 18 in 2005. But the repression has since mounted, with 187 protests put down in 2008-2009, and 150 in 2009-2010. Street protests in the first half of the decade were primarily political in nature, demanding civil and political rights, while from October 2004 to September 2010, demonstrators’ claims were predominantly for economic, social and cultural rights. Some 19,250 protests were recorded over the decade, 71 percent of which were organised to demand social and economic rights, 26 percent for civil and political rights, and the remainder for unspecified purposes, according to PROVEA. The most common modes of protest were roadblocks (5,913), mass demonstrations (5,093), marches (1,290) and occupation of premises (1,506). The protests have become increasingly radical. The general coordinator of PROVEA, Marino Alvarado, said that in 2009- 2010 there were 103 people on hunger strike, while previously only one person had ever protested in this way. “Since 2005, legal and political actions aimed at restricting the right to protest have proliferated, such as introducing criminal laws against contempt for authority, and more severe punishment for those who interfere with traffic flow sor with the work of state agencies,” Belalba said. A month ago, 33 people refused to leave an underground carriage on the overcrowded Caracas Metro, annoyed at being forced to change trains after a long wait. They were arrested and accused of obstructing the railway line and resisting authority. A judge ordered their release after 36 hours. Saud, a 61-year-old unionist who according to medical reports is suffering from skin cancer and prostate disease, has been in prison in Guayana for more than two years. He led a workers’ protest against Crystallex, a Canadian gold mining corporation, and like González he is charged with criminal association and instigating criminal activity.